The Heartsine range of defibrillators is backed up by an enviable range of training devices and accessories do that lay resucuers may familiarise themselves with the operation of devices. The easy-to-use samaritan PAD Trainer with remote control guides users through simulated analysis, energy delivery and prompted Cardio Pulmonary Resuscitation (CPR) intervals with the look and feel of a live samaritan Public Access Defibrillator (PAD) without the actual charge and discharge of an electrical shock. 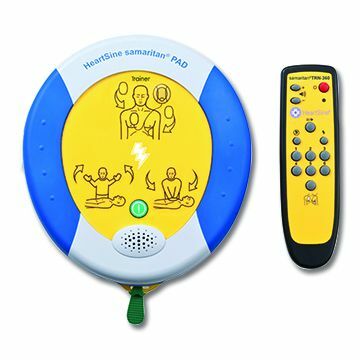 Available in 500P, 350P and 360P configurations, the samaritan training device is designed to help and support trainers fulfil their training obligations. HeartSine® encourage everyone to take part in a training course to help combat the loss of life through SCA. The Universal Trainer is one device designed to help / support the trainers fulfil their training obligations.